Do you still read newspaper? Or do you read news online? I bet it is the latter. According to Journalism.org and Business Insider UK, online news readers are steadily increasing while printed news readers are declining over the time. Convenience, customizability, availability and the lower price of online news is slowly yet steadily winning the favor of most people and taking over the market. And news websites are now making great profit from this trend. Do you want to make profit with online articles too? There has never been a better time than now. And here are a few tips to begin your career of a famous writer. Using data collected from Mashable since 2013 to 2015, I have made the following dashboard using Tableau. The dashboard reveals some tricks, or rather strategies, to produce a popular article. First, we see that news published on weekends have significantly lower shares. Do people not like to read news on Saturday and Sunday? Or do people just not like sharing news on weekends? Who knows? But if you hope your articles to be popular and get as many shares as it can, choose weekdays to publish the article. Next, we see that, title lengths with average 8 to 13 words have the most shares. We know that title speaks volumes, but most importantly, it attracts readers in the shortest time. Titles are important. Too short and there will not be enough power; too long and nobody cares. Thus, informatic, compact and straight-to-the-point are what you will most likely see in popular articles titles. After title lengths, we see the content in an article also has an optimum lengths. Most popular articles have an average content length of 547 words. As mentioned above, too long and nobody reads it. Making your article short is the key, because every word counts. Final problem, we have the best day and the most optimum article length, but what are people interested in? What do we write about? From the dashboard, writing articles on Lifestyle, Social Media has a statistically higher average share count. Here, you might be confused with the previous 2 charts where we see the articles with the highest individual shares are in the Business and Technology channel. Note that, some articles in these 2 channels have indeed the highest shares, but if we exclude these popular articles, we see that the other articles in this channel have much fewer shares. What do you want your articles to have? Random highest shares or steady above-average shares, the choice is yours. And there you go, some simple strategies to improve your articles’ popularity and get more shares. As the future of printed media dwindles, the digital media market blooms. And we might as well take some advantage out of it. K. Fernandes, P. Vinagre and P. Cortez. 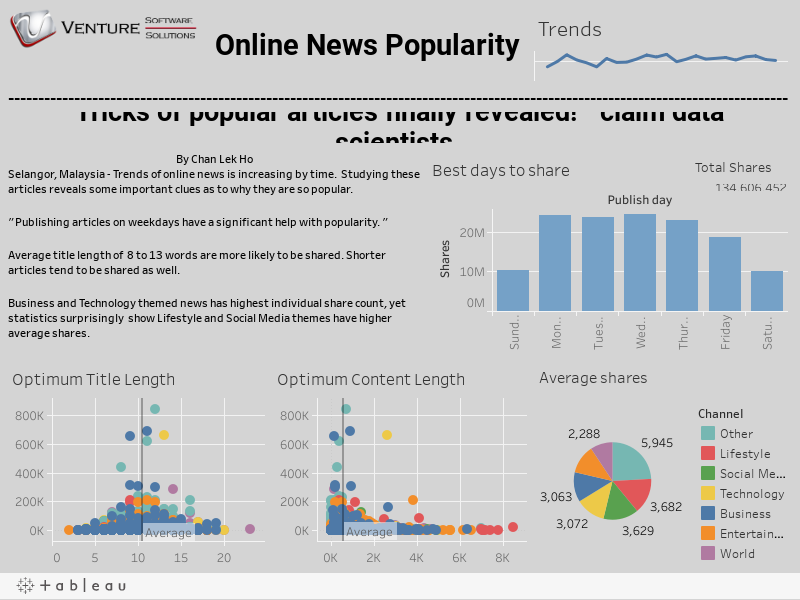 A Proactive Intelligent Decision Support System for Predicting the Popularity of Online News. Proceedings of the 17th EPIA 2015 - Portuguese Conference on Artificial Intelligence, September, Coimbra, Portugal.